Jason Narducy may not be a household name, but you'll know the people he's played with. Over the years the Verboten co-founder has played with the likes of Bob Mould, Superchunk, and Robert Pollard. Now he's put together a new band, Split Single, with Jon Wurster of the aforementioned Superchunk, and Spoon's Britt Daniel. 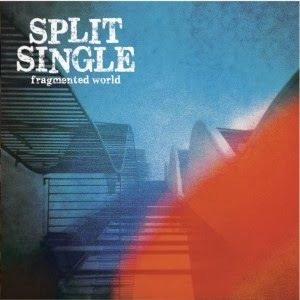 The group will release their debut album, Fragmented World, on April 1st. Narducy incorporates many of the tricks he's picked up with other artists onto his own record. A bashing garage rocker, "Monolith" has the DIY Guided By Voices feel. "Searches" and "Made for Breakfast" both have an abrupt quality delivered with Spoon-like precision. The record's best cuts are the poppier ones. The title track is a guitar-lead indie rock number full of hooks. "Never Look Back" is toe-tapping power pop, while "My Heart Is Your Shadow" is an update on Material Issues' slick catchy sound. The album's outlier is "Last Goodbye". It's a majestic, sweeping song that owes more of it's sound to Spiritualized or The Verve than to the Midwestern underground rock. As such it is also one of the record's most intriguing moments. Fragmented World is easy on the ears, almost immediately engaging, and just diverse enough to never become boring or complacent. In all it's a pretty good way to spend 45 minutes or so. Best tracks: "Fragmented World", "Never Look Back"